Part zero or a little theory at the outset. A long time trying to find an answer to the question of whether the household (or just your own), the laboratory is needed? At the moment I have more in mind training virtualization technologies, but over the years I have had various phases. From the train Solaris (still in the archive have developed a wiki on this subject, the effect of seven years of working with Solaris 8,10,11), the fatigue of tens of technologies and servers on different Linux distributions (including a successful attempt to use it as a workstation only a few years). Times and technology is changing, and this intrusive the problem returns and returns, where to learn? In operation since I always have to deal with testing environments and developerskimi, but it does not it. Someone’s always something there, “tinkering” and requires that everything worked quite well. A study in the profession of Computer Science (read: Administrator) requires that from time to time to cross the last frontier, and something to spoil. 1 For something to sweat out the end. Spoil, check, click (or press enter) without fear of consequences can hurt someone and we will have to reverse the pace of everything. And when you think about perfecting never exceed this limit after which often all you need to “plow” (or reverse from a snapshot or backup). From years of working in teams, sometimes more, sometimes less. Always in the band is so that we have the “old”, “new”, hardworking, lazy, etc, etc. The level of knowledge is varied and often clashing different visions and concepts. In terms “front”, is usually always chosen direction, which I call “success as quickly as possible, with the least amount of effort.” Nobody is interested in your vision, come is correct it is not real, no resources, no time, a new project is started. A thirst for knowledge is not satisfied, the need to prove that my vision is real and enormous. If only for my satisfaction and the knowledge they have acquired and which may someday be useful. For me personally, this thirst for knowledge brought to the position of Information Systems Architect, so I know that it is worth to learn and constantly look for the New. But back to the merits, VMware Lab is a laboratory to prove the vision, and testing of new technologies and concepts. 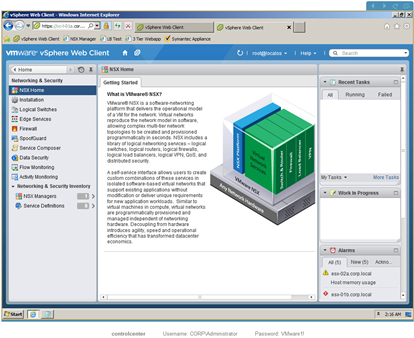 For now, in the form of a virtual (virtual (nested) ESXi stuffed at work) but built to be able to move the physical environment hosts. I decided to build a home mini truancy. I already have quite thoroughly thought-out concept, but, as usual funds mean that whole stretch over time. In the subsequent parts of the series “VMware Lab” I introduced new elements and development environment, and I hope that at some time, I could also introduce physical development laba! 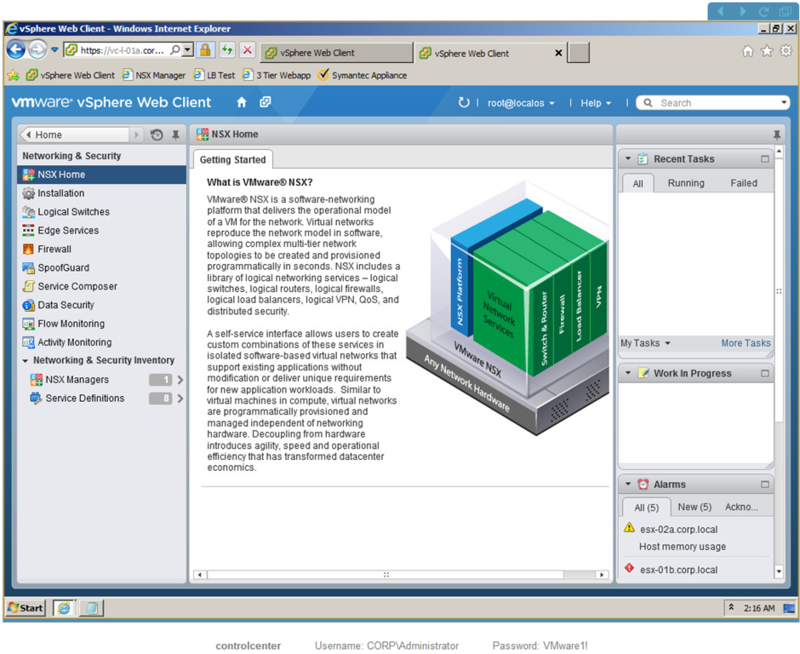 At present, the technology of VMware NSX is not available for download, the opportunity to see in practice what this is about, before the official release, in my opinion, a huge value of this portal. But if he is able to replace their own idleness? Definitely not prepared laboratories are temporary and tailored so as to courses, they can only do what has been planned by the authors. However, the “association” with such a laboratory will definitely answer the question of whether it makes sense to install and test this particular resolved in our LAB (well, not everything is for us, we may never reach for something like the NSX). In any case, to work, in the end without us, pizza alone with the clouds do not jump !